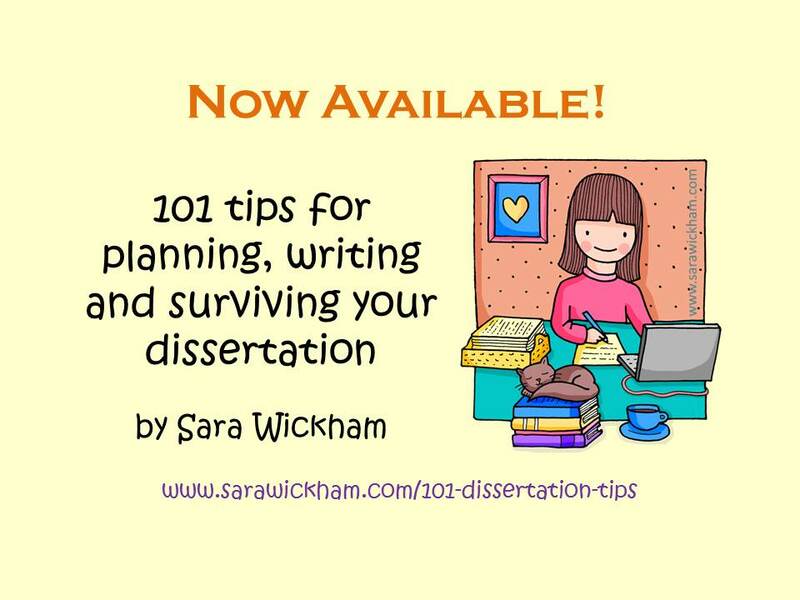 The 101 tips in this book cover a wide range of areas from how to create a good question and keywords to what to do when someone publishes a ground breaking new study on your topic the week before you’re due to submit your work. Written in an accessible, friendly style and seasoned with first-hand advice and comments from others who have trodden the path, this book combines sound, practical tips from an experienced academic with reminders of the value of creativity, chocolate and naps as investments in your work. Dissertation Tip 102: Don’t reference Wikipedia! Where can I get it? This book is available from Amazon UK, Amazon.com, Amazon France, Germany, Canada, India, Italy, Mexico, or Spain (it’s very cosmpolitan!) and it’s also available on the Kindle store for people who like e-books. I will also have copies with me at my UK workshops and events. If you’re struggling to get hold of it in your country, please use my contact form and we’ll do our best to help. How much is it? The recommended retail price is £9.99 in the UK, €13.49 in Europe and $12.95 in the US. Is it just for undergraduates? Not at all. I suspect those doing higher degrees will be more likely to have encountered some of the ideas and tips before, but it’s a hand-crafted book which includes lots of stories and experiences (including from other people as well as my own), so I would be amazed if there was anyone out there who didn’t get at least a few juicy things from it. Is it just for midwives? Nope. It’s true that more of the examples come from midwifery than any other discipline, because I have worked with more people studying midwifery than any other field, but I have also supported and supervised people undertaking research in areas as wide-ranging as medicine, engineering, women’s studies, statistics, philosophy, education, nursing, travel and tourism, psychology, science, anthropology, information studies and epidemiology, and (with permission, of course) I’ve shared a few examples from some of their experiences too, to make it more interesting. I hope it will be useful to people studying any area. Is it just for people writing dissertations? Actually, although that is the main focus, a lot of the tips relate to study skills, writing, thinking about questions, working with tutors and other elements of academic work that may be just as useful earlier or later in your academic career, so if you’re a pre-dissertation student (or are thinking of becoming a student, or have been a student and are writing up research in a different way now) I’d like to think it could help you as well. Also, while we’re on the topic, I’m aware that a lot of people these days undertake undergraduate projects or extended literature reviews rather than traditional dissertations. I’ve covered that too! Are the tips quite short? No, these are not one-line tips. Many are article-length discussions on different areas. They’re juicy and in-depth and I hope, as my website tagline says, they will offer information, inspiration AND illumination! Is it available on Kindle? Yes, and you can order it here. Do let me know if you have more questions and I will add the answers to them in here.